Writes text or macro variable information to the SAS log. places a blank line in the SAS log. is text or a text expression that is written to the SAS log. If text is longer than the current line size, the remainder of the text appears on the next line. The %PUT statement removes leading and trailing blanks from text unless you use a macro quoting function. lists the values of all user-generated and automatic macro variables. lists the values of automatic macro variables. The automatic variables listed depend on the SAS products installed at your site and on your operating system. The scope is identified as AUTOMATIC. lists user-generated global macro variables. The scope is identified as GLOBAL. lists user-generated local macro variables. The scope is the name of the currently executing macro. 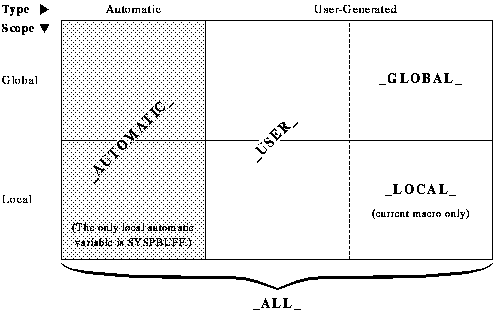 describes user-generated global and local macro variables. The scope is identified either as GLOBAL, or as the name of the macro in which the macro variable is defined. When you use the %PUT statement to list macro variable descriptions, the %PUT statement includes only the macro variables that exist at the time the statement executes. The description contains the macro variable's scope, name, and value. Macro variables with null values show only the scope and name of the variable. Characters in values that have been quoted with macro quoting functions remain quoted. Values that are too long for the current line size wrap to the next line or lines. Macro variables are listed in order from the current local macro variables outward to the global macro variables. Note: Within a particular scope, macro variables might appear in any order, and the order might change in different executions of the %PUT statement or different SAS sessions. Do not write code that depends on locating a variable in a particular position in the list. The following figure shows the relationship of these terms. The %PUT statement displays text in different colors to generate messages that look like ERROR, NOTE, and WARNING messages generated by SAS. To display text in different colors, the first word in the %PUT statement must be ERROR, NOTE, or WARNING, followed immediately by a colon or a hyphen. You might also use the national-language equivalents of these words. When you use a hyphen, the ERROR, NOTE, or WARNING word is blanked out. Note: If you use the %PUT statement and the last message text that was generated by the SYSWARNINGTEXT and SYSERRORTEXT automatic macro variables contained an & or %, you must use the %SUPERQ macro quoting function. For more information, see SYSERRORTEXT Automatic Macro Variable and SYSWARNINGTEXT Automatic Macro Variable. If you place an equal sign between the ampersand and the macro variable name of a direct macro variable reference, the macro variable's name displays in the log along with the macro variable's value. Use a semicolon(;) to end a SAS statement. This example lists the user-generated macro variables in all scopes. Notice that SYSDATE does not appear because it is an automatic macro variable. To display the user-generated variables after macro MYPRINT finishes, submit another %PUT statement. The result in the SAS log does not list the macro variable NAME because it was local to MYPRINT and ceased to exist when MYPRINT finished execution. This example displays the macro variables that are local to macro ANALYZE. In the result that is printed in the SAS log, the macro variable FIRSTVAR, which was created after the first %PUT _LOCAL_ statement, appears only in the second list.